My kids have been fan of Famous Amos' cookies all this while. They have the cookies since they are small. Too bad we can't get to buy this cookies here and only manage to buy it when we make a trip to KL. 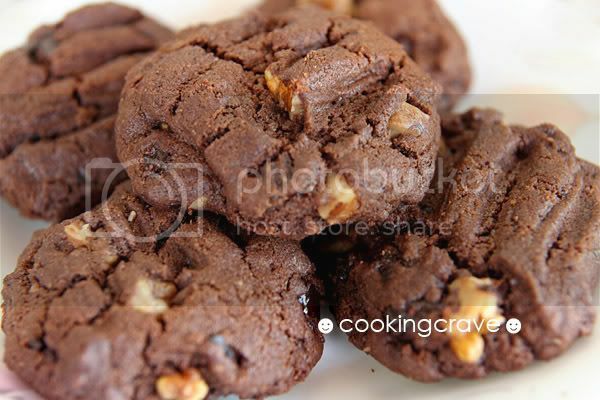 I've been browsing for the chocolate chips cookies recipe online until I read Kikey's blog talking about the chocolate chips cookies she baked and eventually link me to this wonderful recipe from FoongMood. I would like to thank her for being so generous sharing the recipe with me and let my kids at home can have a taste of Famous Amos' cookies. My kids loved the cookies so so much.. I didn't chopped the walnut too small. I love to chew the walnuts in my cookies. Sieve flour, corn flour, coco powder & soda together. Set aside. Cream butter with sugar and brown sugar until it is creamy. Add in egg and mix till well combined. Add in salt and essence vanilla. 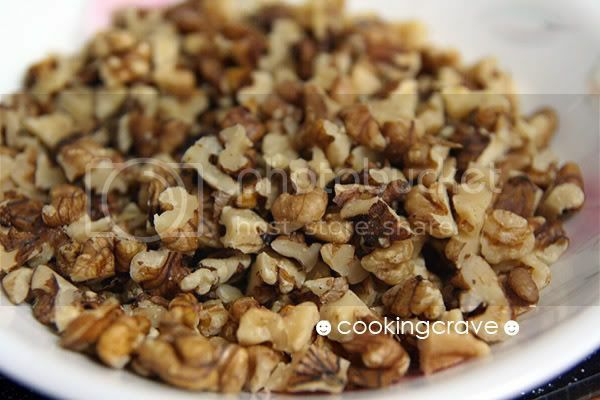 Fold in the sieve flour till it forms dough and mix in the chopped walnuts and chocolate chips. Spoon and drop the dough onto the lined baking pan. Baked at preheat oven at 180c for15-20 mins. My cookies fresh out from oven. Don't forget to let it cool first before you move them to cool further on the wire rack. Look good right?? It taste heavenly, trust me!! 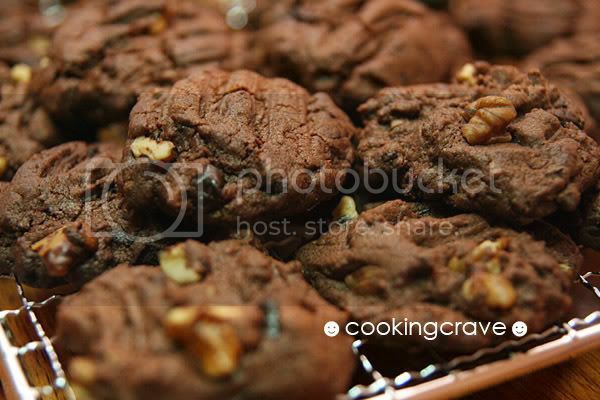 Note: Make sure you use the good quality butter, walnut and chocolate chips when baking this cookies. I use chopped Hershey unsweetened chocolate bar to replace the chocolate chips in this recipe. I am glad that you like the cookies. I'm glad to found ur blog. may i ask does the cookies flatten or spread out alot during bake? What flour did u use? The cookies dough are rather sticky, just leave about 1" space apart for each cookies, the cookie dough won't flatten or spread much. I do press some of the cookies I bake but not all of them. I tried your recipe as written today and the cookies turned out really crumbly. Is that normal?